Melvyn Bragg and guests discuss extremophiles, the organisms thriving in very harsh conditions on Earth and providing clues to life forms on other planets. In 1977, scientists in the submersible "Alvin" were exploring the deep ocean bed off the Galapagos Islands. In the dark, they discovered hydrothermal vents, like chimneys, from which superheated water flowed. Around the vents there was an extraordinary variety of life, feeding on microbes which were thriving in the acidity and extreme temperature of the vents. 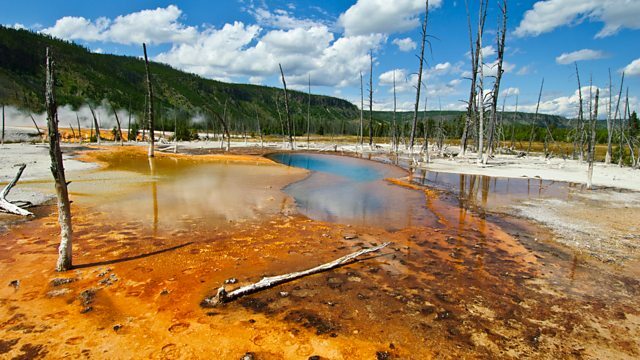 While it was already known that some microbes are extremophiles, thriving in extreme conditions, such as the springs and geysers of Yellowstone Park (pictured), that had not prepared scientists for what they now found. Since the "Alvin" discovery, the increased study of extremophile microbes has revealed much about what is and is not needed to sustain life on Earth and given rise to new theories about how and where life began. It has also suggested forms and places in which life might be found elsewhere in the Universe. Life but not as we know it. Browse the 20th Century era within the In Our Time archive.